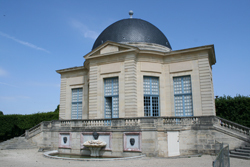 The Pavillon de l’Aurore at the Parc de Sceaux is a noteworthy example of one of the few garden pavilions that have been preserved in France. Only a short train ride from Paris, a trip to see the pavilion and its remarkable painting by Charles Le Brun can be combined with an afternoon visit to the park and its château. We present an in-depth look at this exceptional 17th century edifice in this month’s Paris Insights.